You have the power to help propel the Ayrshire breed to its rightful place in the dairy industry. All it takes is purchasing a membership in Ayrshire Ambassadors Cooperative for a mere $100. That’s right—we’ve lowered our current breeder and Ayrshire club membership fee from $250 to just $100 per year! Retired breeders can join for just $50 and students pay $25. In the past, we’ve relied on word of mouth to market the merits of our breed, but now is the time to invest in the future of our cows, our farms, and our businesses. 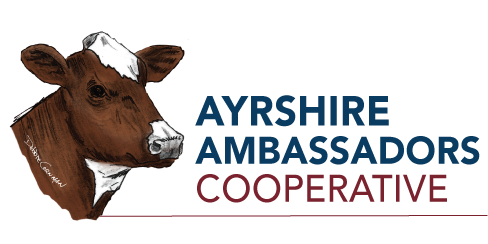 You can help secure a bright future for Ayrshires and all breeders, while earning valuable promotion for your farm, by becoming part of this historic cooperative. Without your support, we can't continue to promote the breed through this website or our quarterly publication. Join today at a new low membership rate.